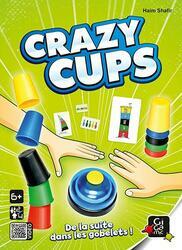 In Crazy Cups, each player receives five goblets in five colors. At the beginning of each turn, a card combining five elements taking the same colors as the cups is revealed. Players must then align or stack their cups quickly to reproduce exactly the same layout as the elements of the card. Attention, it is important to follow the order and the direction of the colors! As soon as a player has finished, he quickly presses the bell. The fastest to correctly realize his series wins the card in game and it is left for a turn. Stay tuned and do not lose sight of your goal because to win Crazy Cups, you must have more in the cups!